Due to the labour dispute at the St. Lawrence Centre for the Arts, Music Toronto ditched its home — the Jane Mallett Theatre — for the opening of its 40th season on Sept. 15. 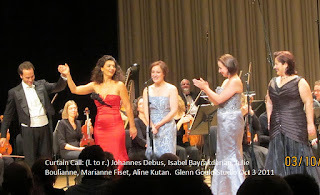 Even though the dispute was resolved earlier that morning, as Music Toronto artistic director and general manager Jennifer Taylor told the audience, the season got off to a good start at the University of Toronto's Walter Hall with the Tokyo String Quartet and pianist Markus Groh. First on the program was a piece the Tokyo quartet played for its Music Toronto debut in 1975 — the Quartet in G minor, Op. 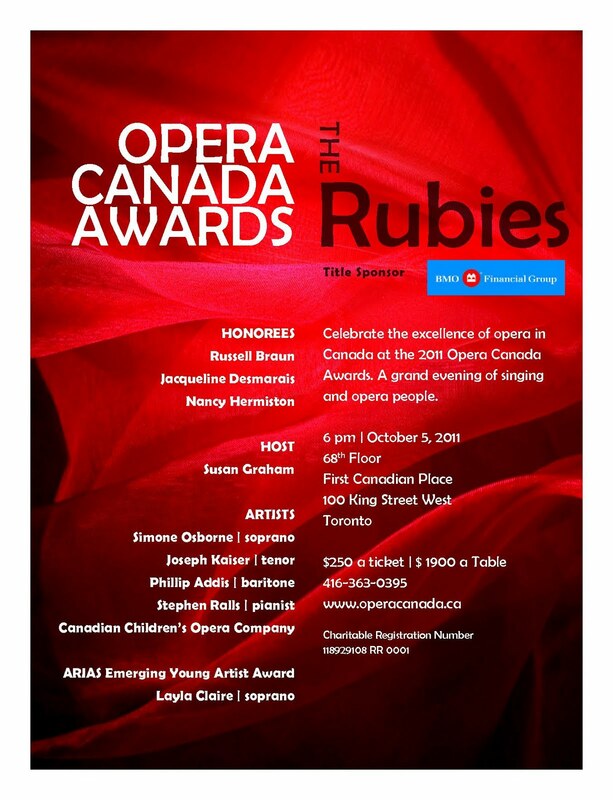 10 by Debussy. There was no shortage of crisp and eloquent playing from first violinist Martin Beaver, second violinist Kikuei Ikeda, violist Kazuhide Isomura and cellist Clive Greensmith. Yes, there was a glaring slip from Ikeda in the last movement, but the impeccable ensemble delivered a fine take that was well-balanced in tonal refinement and texture. In fact, the performance was so polished that a sense of spontaneity and defiance of the music felt just a tad lost. Next on the program was the world premiere of Canadian composer Jeffrey Ryan's String Quartet No. 4, Inspirare(2011). The Latin word, inspirare, means "to breath into". Ryan, composer advisor to Music Toronto and composer-in-resident with the Vancouver Symphony Orchestra, described his single-movement work as an expression of different kinds of breaths, from smooth and relaxed, quick, soft and gentle, heavy sigh, whispering, held, ragged and determined to the actual physical expansion and contraction of breathing. The piece is consisted of three major ensemble sections that are framed by four extended solos — first violin, second violin, cello and then viola — each with a different character and rooted in the pitch of a different open string, Ryan explained in the program note. Inspirare sounded, for the most part, like it could be the Indie soundtrack to Alfred Hitchcock's Psycho. However, we heard more docile slides in general than slashing strings. Besides razor-sharp, high-pitched and sometimes rhythmic scream, we also heard lyrical passages in which melodic scales were the dominating structure and driving force behind scattering yawns and gulps of air that make up one big giant breath. But then, just as you prepare yourself for that last inhale and exhale at the end — the big bang — Ryan throws in a sweet puff — a retreat to thin air that you hear coming out of a deflating balloon. Inspirare is a piece of music that works wonders with a bored mind and the Tokyo quartet gave it a dramatic reading. The premiere was well received by the audience. The Tokyo quartet was joined by Groh, the 41-year-old German pianist, after intermission to perform Brahms' Piano Quintet in F minor, Op. 34. Groh, who has built a considerable reputation as a Liszt interpreter in recent years, played with a straight, rather matter-of-fact style in this sensual and tempestuous piece of work. It's a sharp contrast to the seasoned Tokyo quartet's elastic musicality and the uneveness was especially noticeable in the gentle second movement. That being said, the ensemble work overall was classy and solid, a fine way to end a cool summer night's evening. Hasn’t the Orchestre symphonique de Montréal (OSM) always been a great French orchestra? In the halcyon days of Charles Dutoit, conductor and orchestra became Decca’s house orchestra for French music the way Ernest Ansermet and L’Orchestre de la Suisse Romande had been for the same label a generation earlier. Dutoit is no longer in Montreal, but the orchestra’s reputation for French music lives on; one hardly needs a senior French conductor like 78-year old Michel Plasson to “teach” the OSM about French music. Rather like bringing coals to Newcastle, isn’t it? And yet, this week in Montreal, Plasson did bring something special to this all-French programme and the audience loved it. I must confess that I warm instantly to any conductor who programs either of Gounod’s symphonies, beautiful and joyous pieces, rarely performed. I much prefer either one of them to Bizet’s vastly overplayed Symphony in C major from the same period. In fact, Gounod was Bizet’s teacher and Bizet very likely modeled his symphony on that of his mentor. While one generally thinks of Gounod in terms of Grand Opera, his compositions do include some symphonies modeled after those of Haydn and early Beethoven. Apparently, he wasn’t much influenced by the contributions of Berlioz to French music; there isn’t much drama or angst in Gounod’s symphonies – not much originality either. There are, however, plenty of perky tunes and playful rhythms. Plasson’s reading of Symphony No. 1 would have benefitted from more energy and bravado – surely the trumpet fanfares in the last movement require more assertiveness than Plasson allowed – but happily, the music was well played. Cellist Gautier Capuçon has been steadily building his reputation in Europe and recently scored a huge triumph when he performed with his brother Renaud (violin) and Gustavo Dudamel (conductor) in a concert broadcast to theatres around the world. With Plasson and the OSM, Capuçon gave a superb account of Saint-Saens’ Cello Concerto No. 1. His technique is beyond reproach and his tone full and pleasing in every register. The piece is cleverly scored to allow the cello to be heard at its softest, and Plasson went a step further in getting the OSM musicians to follow suit as required. After intermission the orchestra practically doubled in size for the Ravel and Roussel. Ravel’s Valses nobles et sentimentales is a strange work that usually leaves audiences perplexed. Most of the waltzes are so slow as to be unrecognizable as waltzes and the last section is melancholy to the point of depression. There is nothing in this composition approaching the colour and excitement of Ravel’s more famous waltz piece,La Valse. On its own terms, however, Valses nobles et sentimentales is a marvel of intricate harmonic and timbral invention and Plasson and the OSM gave it its due. Albert Roussel (1869-1937) has always been a maverick in Twentieth Century French music. As impressionistic as Debussy, he too was fascinated by the music and culture of other countries. He was also a classicist, writing four symphonies while Debussy and Ravel wrote none. His ballet score Bacchus et Ariane recalls the driving rhythms of Le sacre du printemps and the sensuality of Bartok’s Miraculous Mandarin. The Suite No. 2 from Bacchus et ariane is probably Roussel’s most frequently played piece today and audiences generally respond positively to its colour and excitement. It is also hauntingly beautiful – the viola and violin solos in the opening bars against a meandering bassoon line are wonderfully eloquent - and hints at something dangerous in its Dionysian fervour. Plasson and the OSM played this music very well indeed but I came away with the impression that Plasson doesn’t really do 'Dionysian.' Gallic charm and old world elegance are not enough here. The music surely requires more intensity - full-throated brass and pounding percussion - in the final section . Plasson won me back by ending the concert with an encore. Neeme Järvi used to do encores in Detroit, but I am not aware of any other conductor doing them. For his encore on this occasion, Plasson chose the Adagietto from Bizet’s L’Arlésienne and while it is a quiet piece, I have never heard it played as softly as it was on this night. What exquisite music and played with love and sensitivity! These “encore” pieces are rarely played at serious concerts anymore although one may run across them at Pops concerts. And what a great way to send an audience out into the night, with gems such as these ringing in their ears and warming their hearts. Vive Michel Plasson! For the record, this was my second visit to the OSM’s new hall and this time I sat in the third row of the Corbeille, or First Balcony. The sound was much warmer here than it was from my last seat in the Balcon or top Balcony. The quiet passages – of which there were many in this concert – sounded just right. I expected a better test of the loud passages than Plasson gave us, but once again everything was clear and had presence. So far, I am not impressed with the bass response; I don’t hear that characteristic buzz on the low notes of the double basses nor does the sound of the bass drum have much depth. It is early yet and there is fine tuning to be done by the orchestra and the technicians. Regarding the lobby areas in the hall, I must note that I was very favorably impressed by the Parterre level space. Last time, much of this space was curtained off for VIP receptions. On this night, the lobby seemed much more spacious and the coloured lighting with furniture to match was very effective. In good weather, once the exteriors are finished, it will be possible to stroll on an outdoor terrace opening off the Parterre level at intermission. September 30, 2011 8:00 p.m. Although Koerner Hall's 2011-12 Season opened back on Sept. 8 with guitarist Richard Thompson, the classical music programming began on Sept 30, with a free concert of the RCM Orchestra under its maestro Uri Mayer. As you can imagine, it was a very hot ticket. People lined up for a chance to hear these talented young musicians hours ahead at the box office. They were treated to an evening of exciting music making. The concert opened with welcoming remarks by James Anagnoson, Dean of the Glenn Gould School, and Mervon Mehta, Executive Director of Performing Arts. 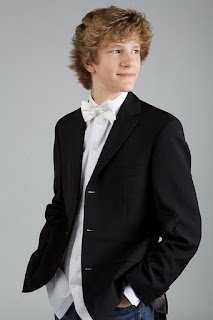 The soloist for the evening was the Canadian piano wunderkind Jan Lisiecki playing the Chopin Piano Concerto No. 2. Born in Calgary of Polish parents, Jan Lisiecki at age 16 has already established himself as one of the brightest stars in the Canadian musical firmament. 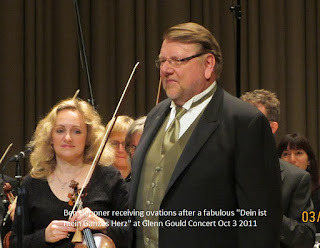 Just this summer, his appearance at the Verbier Festival received uniform kudos. On this occasion, he played the Chopin No. 2 with technical prowess and innate musicality, showing a poetic imagination and a maturity rare for someone his age. In addition to the concerto, the program also included an opening piece, the Overture to Flying Dutchman. This being Wagner, it requires a Wagnerian-sized orchestra, perfect for the RCM to showcase its many orchestral students. Under the expert baton of Uri Mayer, the orchestra made a huge, vital sound, full of youthful impulse and enthusiasm, although it must be said that the brass section - including the tuba - had several intonation lapses. Given the brass instruments are notoriously temperamental, these little mishaps in a student orchestra are inevitable and served as part of the learning process. In the Mussorgsky that made up the second half, things went much better for the brass section - they played beautifully, and the orchestra as a whole was very impressive. As the school year progresses, we can expect these talented musicians to continue to improve and delight their audiences. 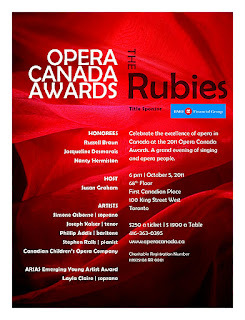 Opera In Concert's 2011-12 season opened this afternoon with something different, a decidedly non-operatic program, Habanera as an encore notwithstanding. 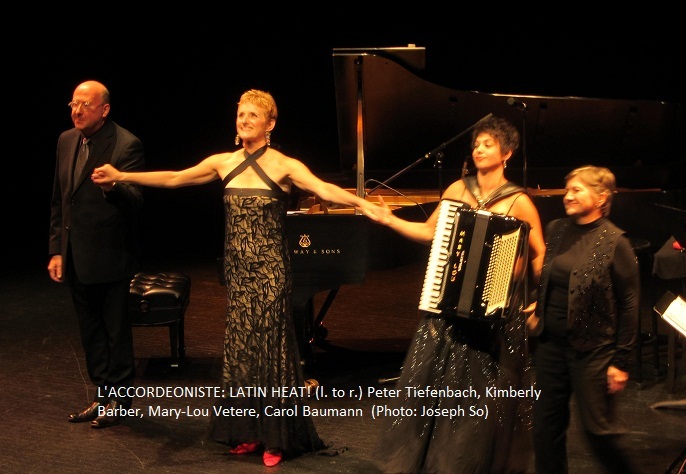 It starred the group L'accordeoniste, made up of four very talented musicians led by mezzo-soprano Kimberly Barber. They recorded a debut CD last year the launch of which I attended. At that event, they performed a few selections from the album, so this afternoon was the first time I heard a full-length concert live with them. Perhaps because it wasn't "opera" in an opera subscription series, the intimate Jane Mallett Theatre was not very full. Well, those who stayed away missed a very enjoyable concert given by four terrific musicians. Often when opera singers attempt so-called "cross-over" repertoire, their training and technique mean that they still sound like opera singers. Not Kimberly Barber - listening to her Noel Coward and Kurt Weill this afternoon, one would never have guessed that she's had a major career as a celebrated Xerxes, Rinaldo, Octavian and Composer. A versatile artist, Barber sings this material completely idiomatically, with all the right inflections, accents, and great attention to the words and the drama. A high mezzo for her whole career, the voice has darkened with maturity while retaining much of the gleam and richness, if also a somewhat more pronounced slow vibrato. Her way with words makes these songs of love and love lost come alive. This particular afternoon, she appeared to be facing some sort of wardrobe malfunction - more specifically the train of her dress constantly at odds with her stiletto heels. Despite these little annoyances, Barber kept her cool and gave a lovely performance. She could not have had a better collaborator in accordionist Mary-Lou Vetere who is a super-virtuoso and a true collaborator of equals. Her solo pieces were dazzling as usual. Peter Tiefenbach of course has a very fine reputation as a collaborative pianist. His versatility and his sense of humour - not to speak of his more than serviceable tenor (although he didn't sing on this particular afternoon) - comes in handy. Often in a group, the percussionist is an afterthought, but the marvelous Carol Baumann was magical this afternoon in creating amazing sound effects as well as the traditional percussive backups. Latin Heat! was the perfect tonic for a cold and wet early fall afternoon.